Have a listen and see what you think, you can even download them if you like the tunes. 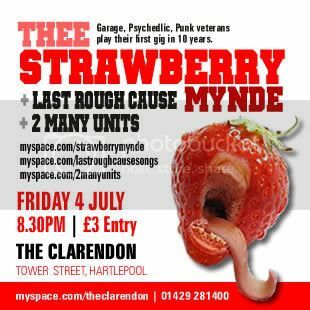 Thee Strawberry Mynde play their 1st gig in 10 years on Friday 4th July 2008 at The Clarendon in Hartlepool. Tickets are on sale now at £3 and available from the band. Support comes from Last Rough Cause and 2 Many Units. Good luck with the gig tonight! Agent IndiePop wrote: Good luck with the gig tonight! Comeback gig went great! Got some really good reviews in the local newspaper (Evening Gazette) and Link newsletter. Here's a clip from Saturday's Party In The Park gig. Wasn't a great set by our standards, but 'Word Girl' doesn't sound too bad on this clip. My band Thee Strawberry Mynde have got a few gigs already in the diary for this year. First one is in a couple of weeks with King Mojo. Also this year we will be releasing our debut album. It's only taken us 20 years to get round to it!